Our church building is 175 years old! 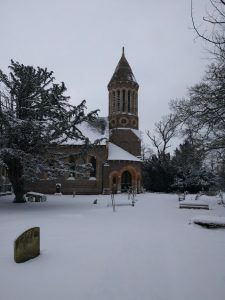 There has been a church at Burghfield since the time of the Domesday Book, but the current building was completed in 1843, making it 175 years old in 2018. We would like to celebrate the place of this lovely building in our community…and we need your help. Our Archdeacon, Ven. Olivia Graham, will be preaching at this service to mark our special anniversary. All are welcome, young and old. Come and celebrate the role of this building in your life! The wonderful Burghfield Santas are holding the second annual Box Kart Bash on 24th June, our celebration weekend. Come and see us on the Hatch: we will have a small selection of items from our exhibitions, and delicious cakes for sale! Then go onto church for the full experience! At the May Fayre we will start a Memory Book, for everyone to write their own special memories of St Mary’s. Come and read what others have written and add your own memories either at the May Fayre or on the Celebration Weekend. We will also have a collection of postcards relating to the Parish, and photo albums from past celebrations and events, usually held at the Berkshire Record Office. Objects could include; vegetables you’ve grown, flower arranging, lego models, knitting, sewing, drawing, writing, crochet, baking, cake decorating, paper crafts, painting, woodwork, ceramics……what have we forgotten? Or maybe you have something you’ve created, but it is not a physical object: a community event, a friendship group, a new club, a local charity…… again, please fill in the gaps, and share with us. Bring photos, leaflets, a description, something to represent your creation, and set up a table. Local schools have been invited to participate in a competition to celebrate the anniversary: come along and see the entries, and the prize-winning posters!